Today’s tutorial is brought to us by our very own recently-retired-shipper Dixie! Please stop in at her blog, What’s Next. She has super cute stuff there. 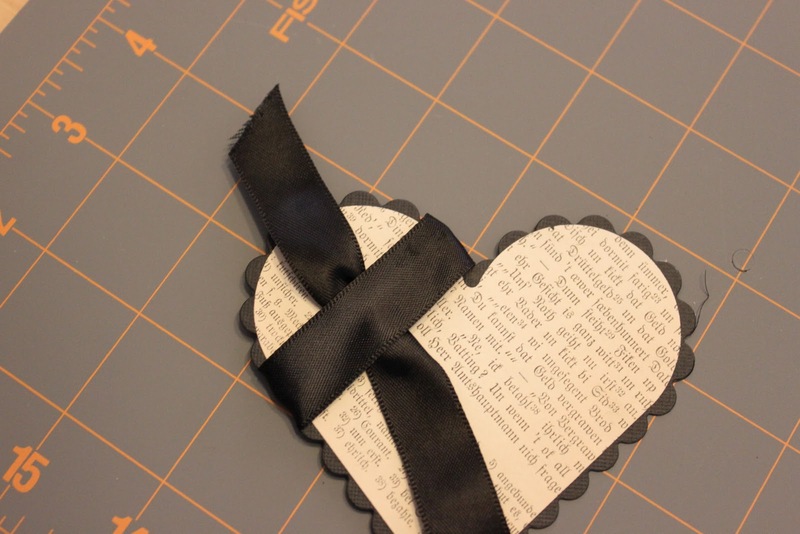 I’ve seen several “tutorials” for tying ribbon on cards, and I thought I’d add mine. 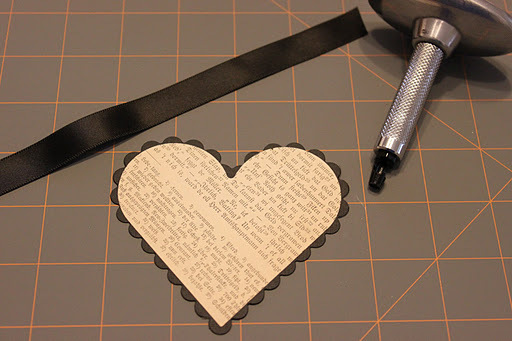 This method uses no adhesive or glue, and trust me, it’s not going anywhere! 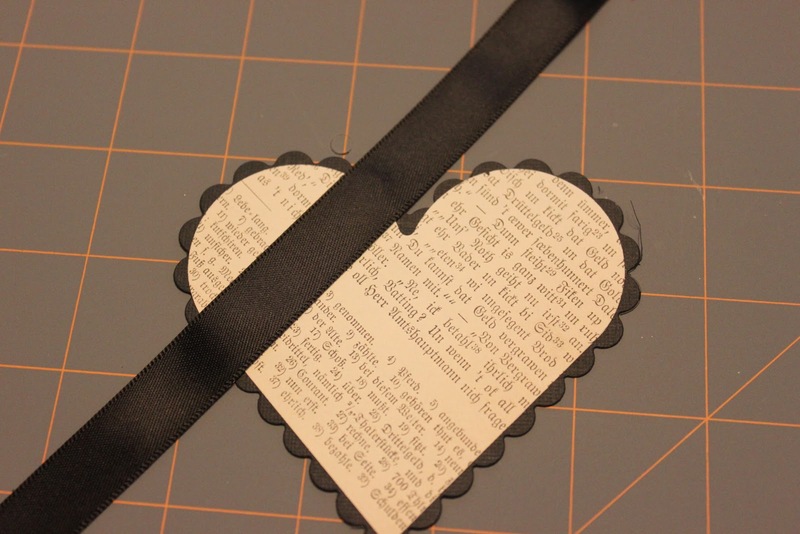 You only need to make one tie, and you don’t have to worry about the tightness of the ribbon around your project. It will be tight, and it won’t move. 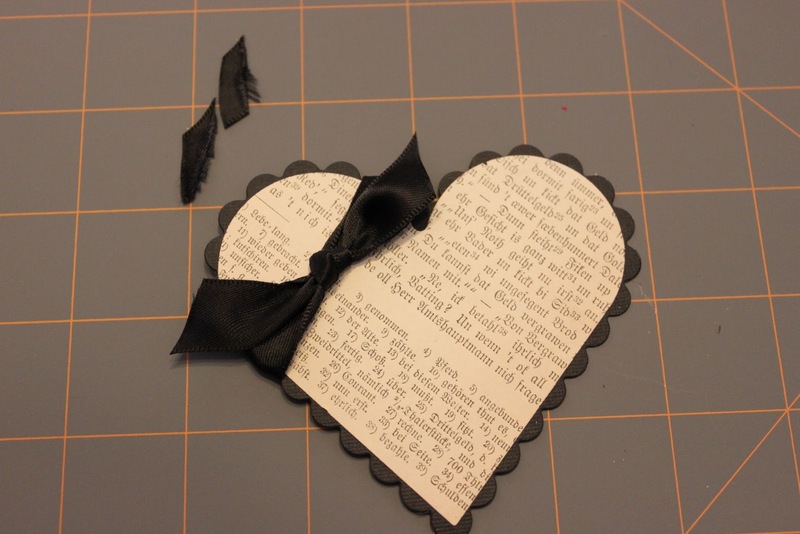 I’m working on some hearts for cards for Operation Write Home, and this technique makes card making quick when you’re doing multiples. 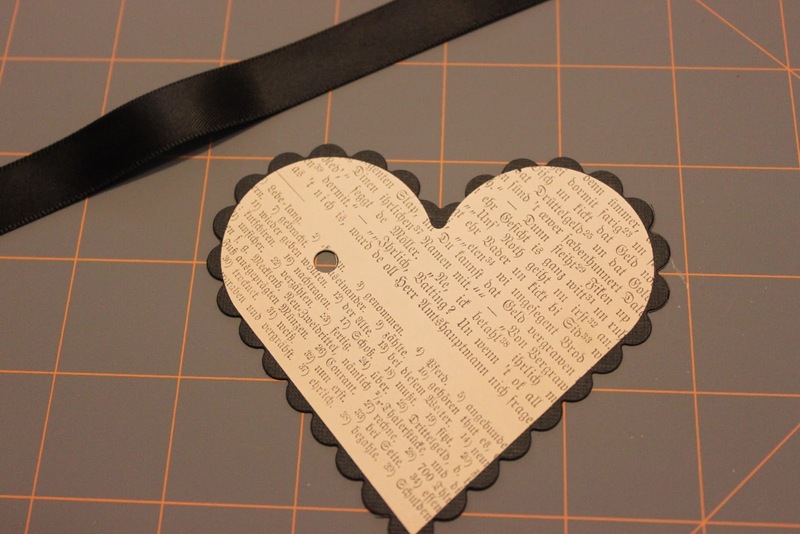 You’ll need your project, ribbon, and a hole punch. I generally grab my “anywhere” punch, but any punch will do. 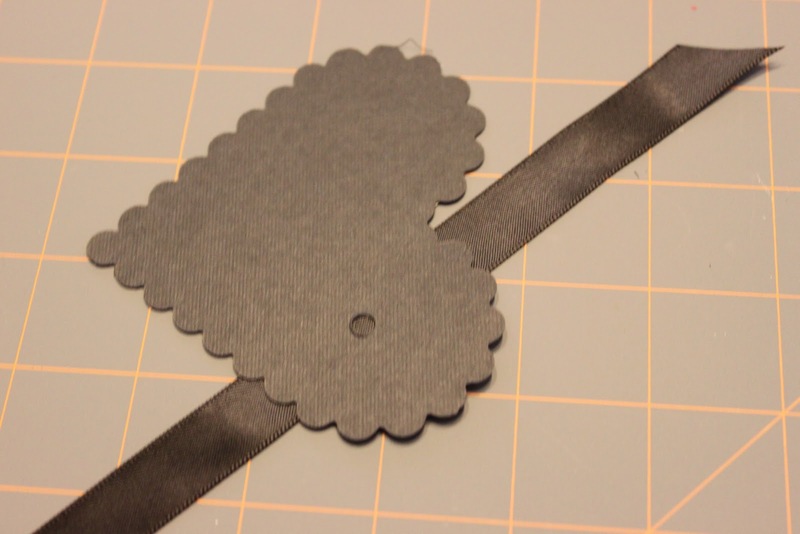 Pick the hole size based on the width and thickness of the ribbon. Punch the hole where you want the ribbon tie to be. Lay your ribbon across your project. Pull! 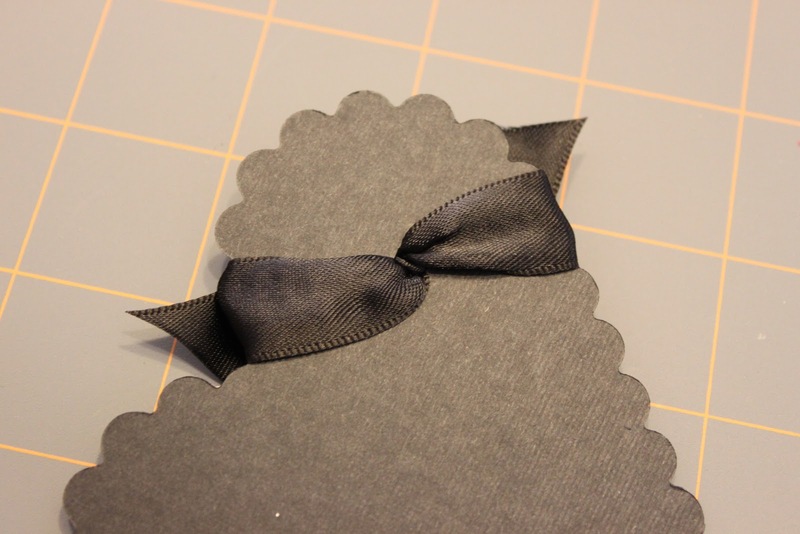 Try to keep the ends even, and pull them on either side of the ribbon on the front of your project. Tie and clip the ends! Here’s a picture of the back. It’s nice and flat, and it’s not going to move! You can see another example of this technique on my niece’s wedding invitations HERE. Thanks, Dixie, for sharing this technique with us! Remember, everyone, if you have a technique to share, please contact me at kate@operationwritehome.org. Thanks, Dixie; I'll try this technique. And I love your newsprint/text heart!! Than you Dixie! I'm going to try this.My faves-easy and beautiful!! Thanks! I'm going to give it a try!! Pat K.
Thanks for the tutorial – it's just the technique I needed to learn! Can't wait to try it out! Oh what a GREAT idea thanks so much for sharing! Love this technique and I just used it on a card. It's so easy! Thank you! Great technique. I love it. Thanks for sharing. Fantastic! I will be using this! thank you for sharing! What a great technique. I used it yesterday and it is really easy and looks great! Thanks so much for sharing your talent with us! 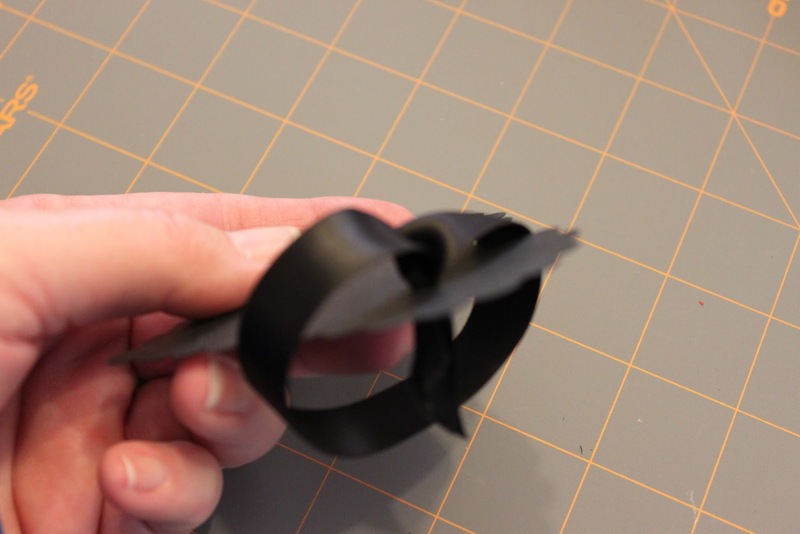 Awesome tip on adding ribbon to artwork. I printed it out for future reference. thanks so much. How easy and how brilliant! Just tried it. Love it. Thank you so much for sharing this with us. Thank you for sharing this delightfully convenient configuration you've created. I used it right away so I would have a record. I haven't yet figured out my google accounts and sharing. I have seen a photo page before and added some pics. I'll try to scan my card and share a link with you. God bless you. Thank you for being. I love this… wonder if my butterfingers could do this?